Found primarily in the central and eastern United States, fox squirrels are significantly larger than most other squirrel species -- up to twice the size. This adaptation, along with different fur colors, well-developed front-body muscles and flexibility in their nesting choices helps fox squirrels survive in areas shunned by other squirrel species. Fox squirrels are the largest tree squirrels in the country, according to the Longleaf Alliance. They grow up to 26 inches long, including the length of their tails, and weigh up to 2 1/2 pounds. Because the trees in the forests where fox squirrels typically live are spaced out farther than squirrels can jump with little underbrush to help the squirrels hide, their larger size helps them move quickly over open ground between trees. Their size also gives them the power to crack open big pine cones to access the tasty seeds inside. Fox squirrels often live in longleaf pine forests, where brush and stumps are frequently cleaned out by wildfires, although they can live in hardwood or mangrove forests. They can be a variety of colors including black, gray and reddish-brown. 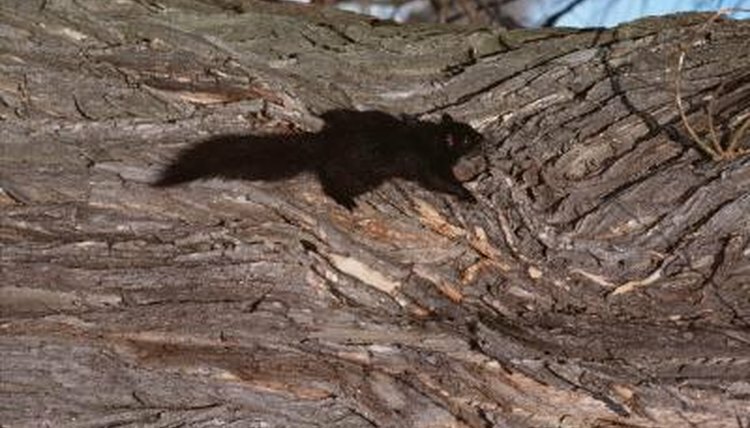 Their coloration often reflects their habitat; black squirrels, for example, are more common in areas that suffer from wildfires often, while gray squirrels mimic the color of branches in hardwood forests. The squirrels often have "masks" that are different colors from the rest of their bodies. A black fox squirrel might have brown around its face, while a gray squirrel might have black. With a fox squirrel's larger size comes increased strength. The fox squirrel has adapted strong muscles in its forearms, abdominals and paws. This helps the squirrels climb and jump between trees; the powerful forearm and paw muscles grab the branches when they land. Sharp, curved claws also help while climbing and jumping. Although fox squirrels spend more time on the ground than other tree squirrels, they still are avid climbers. Most tree squirrels find hollow caverns in tree trunks to make nests. Fox squirrels often take advantage of tree dens, but unlike other tree squirrels, they also have adapted to make nests out of leaves in the crooks of branches. Especially in pine forests, tree hollows aren't always available, and they might not be large enough to comfortably house a fox squirrel. Developing the ability to create a nest elsewhere in the tree extends the fox squirrel's habitat range.